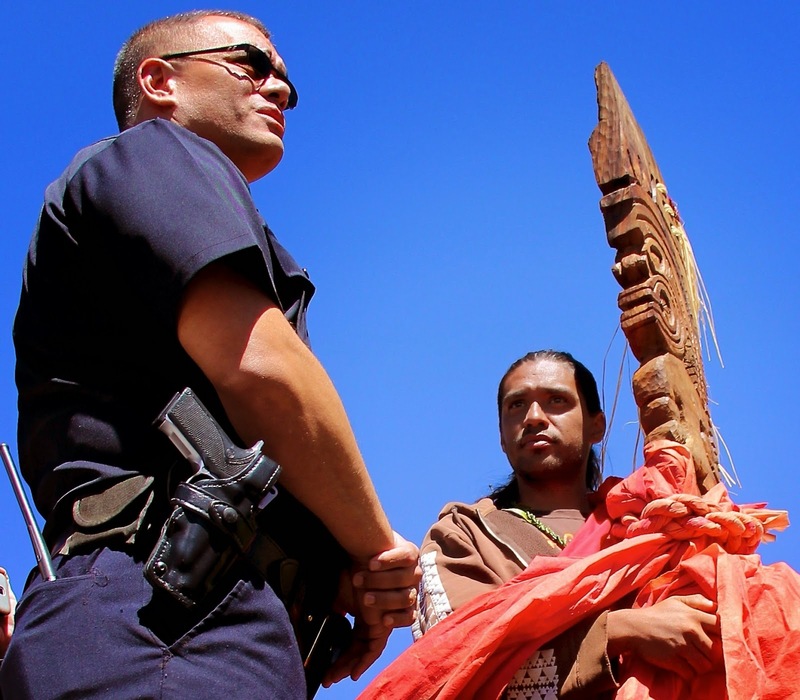 MAUNA KEA, Hawai’i Island, March 30, 2015 — Today marked the sixth day and sixth night since a group of Kanaka Maoli warriors representing several islands in the Hawaiian Islands and a multi-ethnic group of supporters formed a blockade at 9,000 feet above sea level at Mauna Kea also known as Mauna A Wakea on Hawaiʻi Island. They are protesting the construction of a 30-meter telescope (TMT), which they say is a desecration of the most sacred place in the Hawaiian Islands. The peaceful protest has been ongoing for several years but in the past several months has gathered more momentum and support from Hawaiians and other non-Hawaiians around the world. Today also marked the first day that TMT workers showed up since the protest began six days and six nights ago. The protesters are being led by Lanakila Mangauil, a prominent cultural practitioner from Hawai’i Island. Mangauil, who had an enormous amount of help from hundreds of people who facilitated the success of the first protest, was able to stop the TMT ground breaking on October 7, 2014. Today’s protesters have been inspired by the success of the October events and are continuing to hold steadfast to their plan not to allow any TMT workers into the area. They have vowed to block them all. The protesters are holding checkpoints, such as a roadblock on the Mauna Kea access road to do this and, in particular, at the 9,000-foot level at the Visitors Center. The University of Hawai’i/Manoa and “Mana” hui, working with the U.H./Hilo student body and others, will host an event that protest organizers Kealoha and Kiulani Mahuka and other friends of the Mauna will attend. Kealoha and Mahuka will offer remarks. The event begins Tuesday, March 31, and will continue until Wednesday, April 1. Wednesday, April 1 on O’ahu: Organizers Kealoha and Mahuka will stage a protest at the “Capitol” beginning at 6:30 a.m.
Alapaki Heanu and Noelani Maka of Maui will organize an event at U.H./Maui. Date and time TBD. Protests on other islands are currently being planned and details will be available soon. The group is requesting donations for flights to and from Hawaiʻi between the other Hawaiian islands as well as much-needed accommodations, including food, ground transportation and other essentials. Those interested in donating may click on the Sacred Mauna Kea Fund link: http://www.gofundme.com/sacredmaunakea or contact Kealoha at sacredmaunakea@gmail.com. Soutien total aux peuples autochtones dans leurs combat pour l'environemment et leur culture.